The system comes in a medium sized box that has a bunch of wooden dowels with rubber stoppers on them. 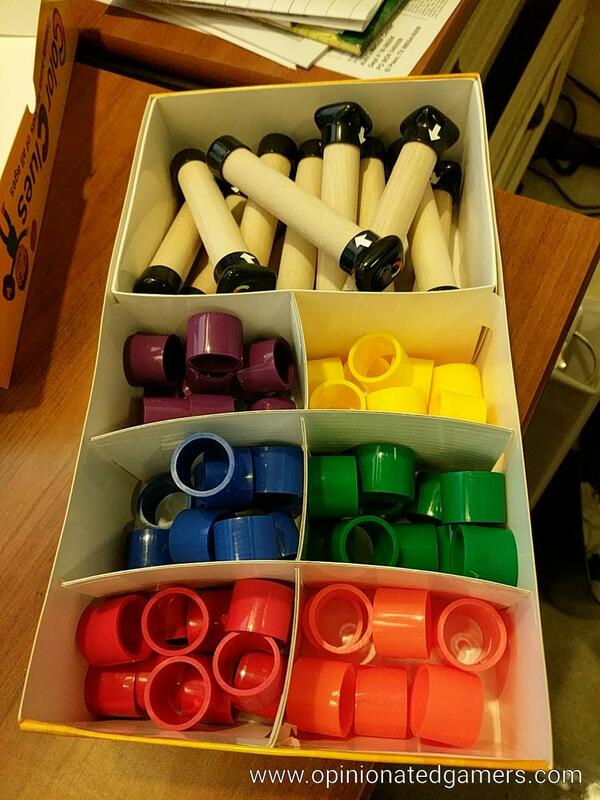 There are a bunch of rubberized rings which can be slipped onto the dowels – six different colors. The hunt itself is run off of a phone app – both iOS and Android are available. You can either use pre-made hunts found on the app, or it’s fairly easy to make your own. 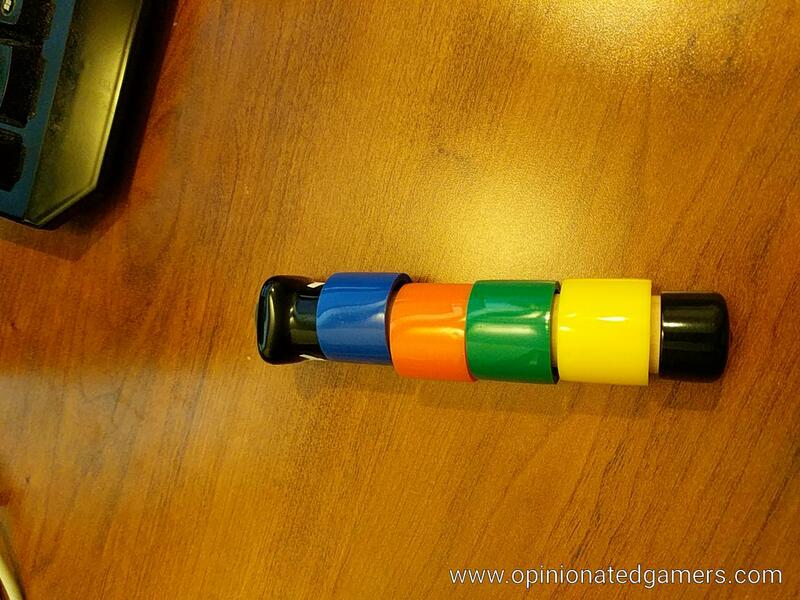 The clues are all combinations of four colors found on the dowel. The first clue dowel is simply given to the child. They then load up the app on a phone and then plug in the colors in the right order. 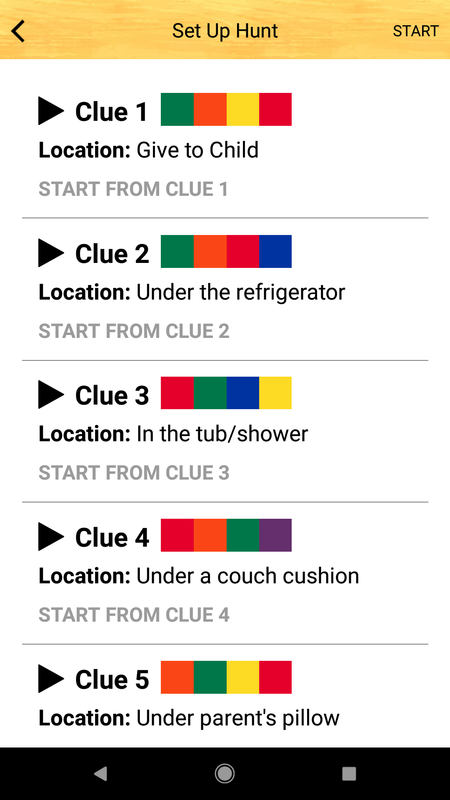 If the correct combination of colors in inputted, an audio clue describing the next portion of the hunt will play on the phone. Something like “now go to the place in the house where you get your favorite snack” – and then the next dowel will hopefully be found in the box of Twinkies in its usual location in your kitchen. The child then can input the new color combination found there, and continue on in the hunt. The system is dead simple to use, and honestly, any child who is old enough to understand the basic instructions should be able to participate. 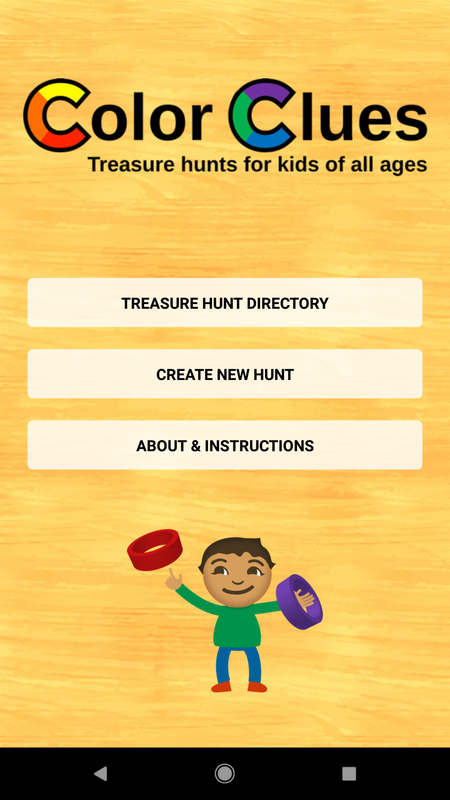 The clues are easy to make, and if your child doesn’t understand the clue or mishears it, all he/she has to do is simply input the clue color combination back into the app to hear the clue again. I tried the system with a younger child in the neighborhood (a 6-year-old), and it went over exceedingly well. It works well with younger kids – though, in its current state, I’m not sure it would be useful for more “grown-up” uses… But, as the system is app-based; it could certainly be modified to work for all ages! It’s fairly easy to make your own hunt. You create a hunt, name it whatever you like, and then you start to edit it. You simply record the clues on your phone, and then you can place them in any order that you like. The computer then assigns color combinations to each clue. And, this is the biggest limitation to me – I would really like to be able to create my own color combinations to be used to the clues. That way, I might be able to use inventive ways to generate clues. Maybe based on the colors of the cereal boxes in my cabinet – or perhaps using the colors of different houses on my street. 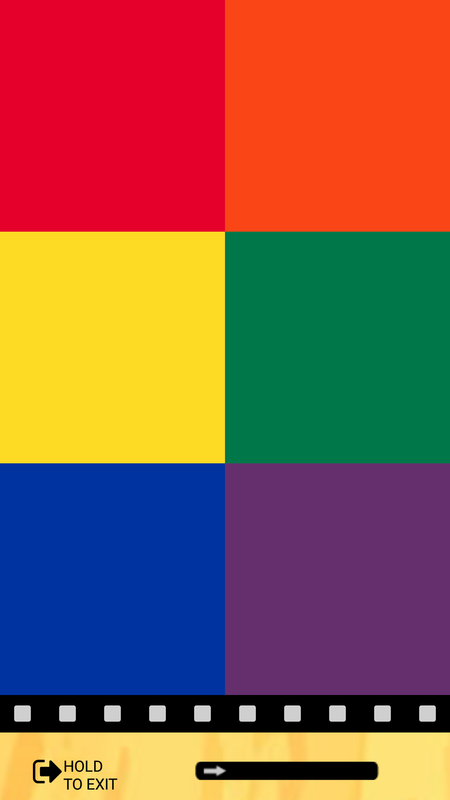 Or I could use a combination of the colors and shapes (used in the colorblind set) to devise puzzle answers. As it stands, I pretty much have to use the dowels as it’s the only way to make sure that I have the right combination of colors. I suppose I could also print out strips of paper with the colors on them, but essentially, it’s harder to make decent puzzles when you can’t choose the answer. 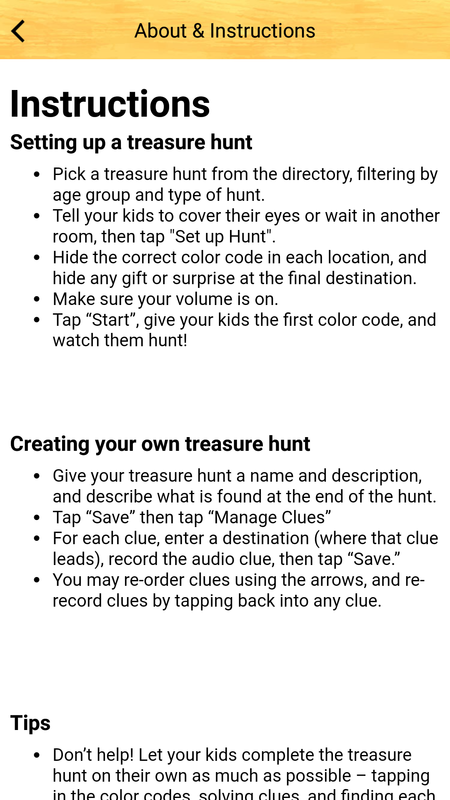 The other limitation of the system which makes it less useful for adult puzzle hunts is the fact that all the clues must be audio. This makes it much harder to do anything competitive with it as other people could overhear the next clue. Admittedly, this isn’t what the system was made for, so it’s not really fair to criticize it for that – but… if it was able to give text clues on the app, that would make it super useful for me! This could be a great teaching tool for home or in schools, and with just some slight modification, it could actually be quite useful for more adult puzzle hunts as well. I will be keeping an eye on the app to see if it is updated in the future.